I didn't mean to go missing for two weeks from the blog. I guess back to school tasks in the school library, getting back to the gym regularly and taking two weeks to read this book all conspired to keep me away. But here I am, with my first RIP VIII book done. Hooray! 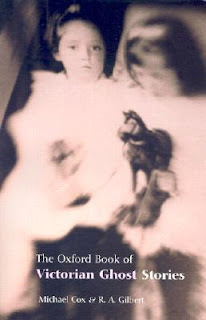 The Oxford Book of Victorian Ghost Stories is a collection edited by Michael Cox and R.A. Gilbert. It has 35 stories, written between 1852 and 1908. As they are presented in chronological order, it was quite interesting to see the progression of the ghost story through time, though the basic elements of the stories really did stay the same. Amelia B. Edwards, Was It an Illusion? If you read Victorian fiction, you probably recognize a lot of the names on that list (and there were other stories by Dickens and Kipling and more). It was interesting to see that ghost stories were standard fare for many authors of the time. The story that I found most haunting was the last in the book, the one by Algernon Blackwood. It made me seriously uncomfortable while I was reading it and it was just a great ghost story, with a fully explained but nonetheless frightening scenario. I've done you a favor and found an online copy of The Kit-bag. If you need just one creepy story to get you in the mood for the season, this might do the trick. Enjoy! This looks fantastic -- literally. I have never seen anything by Jerome K. Jermone aside for Three Men in a Boat. I would read the book for that story alone. Thanks for the recommendation. So many authors on this list that I've been wanting to read and some actually sitting on my shelf. This looks like a great mix! It really was a good anthology. I thought there was maybe one or two duds, like the one vampire story -- which I didn't think belonged in a ghost anthology. Otherwise, it was fun, if a little slow because of the period writing. If I read it again, I would probably break it up to read a story a day along with my other reading. Wilkie Collins! Mary Elizabeth Braddon! E. Nesbit! Sounds like a wonderful anthology. I was happy to get a Wilkie Collins ghost story that I hadn't read before. And the E. Nesbit story was FANTASTIC and super creepy. I knew it would be a good collection because of Michael Cox's involvement (author of The Meaning of Night). Oo, and Michael Cox edited it and all! That's quite cool, I didn't know he did things in that line. Yes, I think that's actually what he did before he finally wrote his own neo-Victorian novels. I guess that's why they were so good! I sure wish he had been able to write more than two.